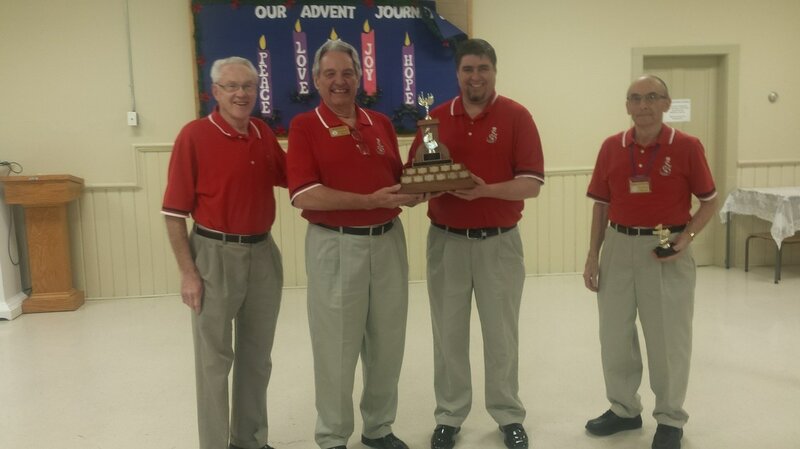 Thanks to our Novice Quartet Contest co-coordinator, Jim McDougall, this year's competition turned out to be one very enjoyable experience for all chapter members involved, and our thanks go out to the award winning quartet from Sarnia, Resolution, for filling in as our official team of judges for the night. Their musical expertise and talents where appreciated and enjoyed by all of us throughout the night. Winners of the night was the quartet taking the name "Devil and Three", seen here after receiving their trophy. From left to right they are Ron Madill (Tenor), Jim McDougall (Bass), Paul Stuckless (Lead) and Roswell McPherson (Baritone). Scroll down further to view a video of them performing their two songs. Congratulations guys! The second place winners for the night, was a quartet called Out Of The Dark, consisting of Ron Madill (Tenor), Paul Stuckless (Lead), Reuben Bloemendal (Bass), and John Gough (Baritone). The same four guys, singing the same , individual parts, formed a second quartet called Don't You Forget, and they achieved third place.